The very earliest supermassive black holes in the Universe may have grown in intense and sporadic bursts. Scientists determined this by comparing theoretical models to Chandra surveys including the Chandra Deep Field-South and other data. They found that only a small fraction of supermassive black holes were actively growing at a distance of 13.2 billion light years. In order to find more about these very distant black holes, researchers hope to conduct wider X-ray surveys of the sky. New research using NASA's Chandra X-ray Observatory and the Sloan Digital Sky Survey (SDSS) suggests supermassive black holes in the early Universe underwent sporadic yet intense periods of growth in the first billion years after the Big Bang as described in our latest press release. Scientists determined this by comparing theoretical models to data from the Chandra Deep Field-South (CDF-S), the deepest X-ray image ever obtained, and other Chandra surveys. 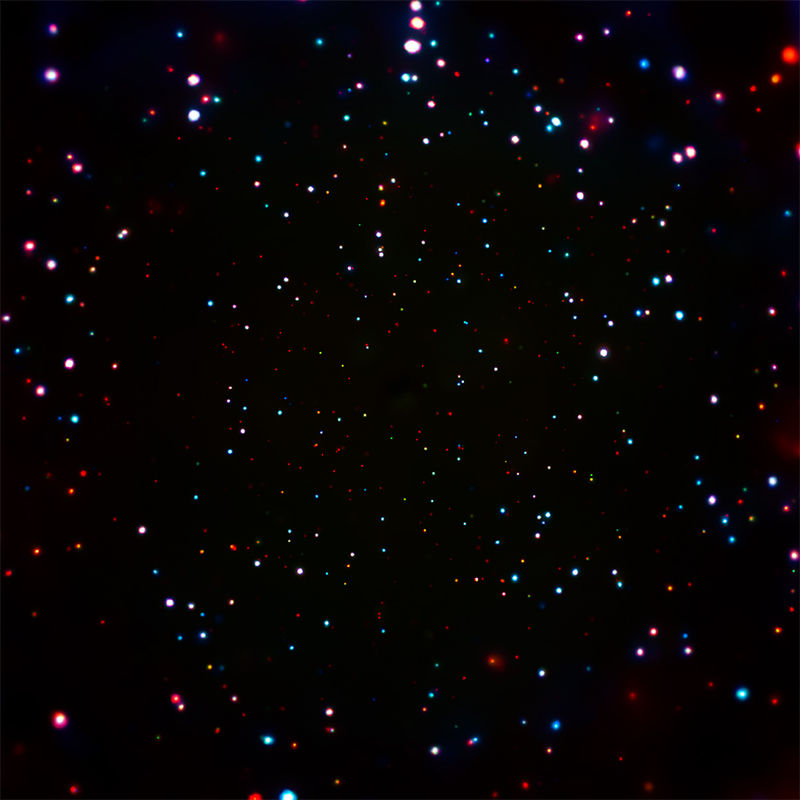 This central region of the CDF-S, where red, green, and blue represent low, medium, and high-energy X-rays detected by Chandra, is seen in the main panel. When material is falling toward a black hole, it becomes heated, and produces large amounts of electromagnetic radiation, including copious X-ray emission. 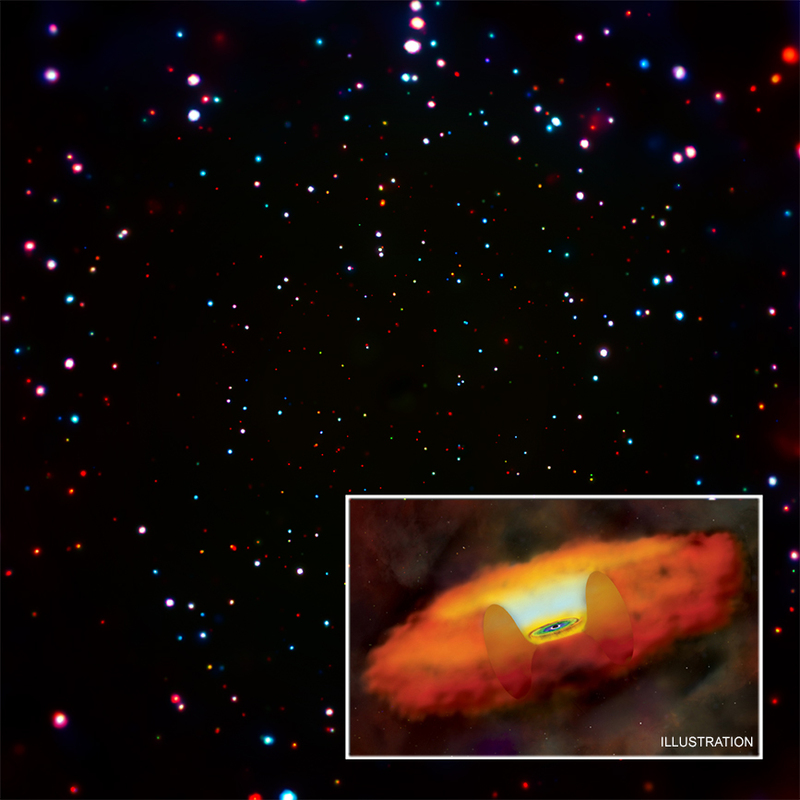 The artist's illustration in the inset depicts gas falling onto an actively growing black hole via a disk. X-rays from this disk can penetrate the cocoon of material surrounding the black hole. Rapidly growing black holes in the very early Universe should be detectable with Chandra. However, these growing supermassive black holes have proved to be elusive, with only a few, yet to be confirmed candidates found in long Chandra observations such as the CDF-S. The timing of such growth may be key. The authors' model suggests that 13 billion years ago, about one third of supermassive black holes may have been accreting enough matter to be detectable. Just 200 million years earlier — a veritable blip in cosmic time — the number of potentially detectable black holes is only about 3%. In order to test this idea further, the researchers suggest that surveys that look at larger swaths of the sky in X-rays are necessary. An X-ray view of deep space into the constellation Fornax. About 11.9 to 12.9 billion light years from Earth.